Here are the lateral thinking puzzles to challenge your brain. 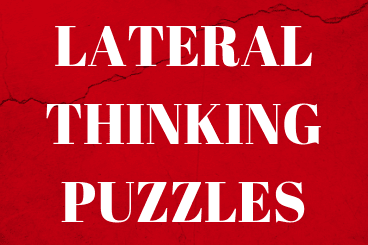 To solve these lateral thinking puzzles, you will need to twist your brain and has to think out of the box. Some of these riddles will appear impossible to solve, but if you start thinking logically, you can solve these puzzles easily. Let's see how many of these out of box thinking puzzles you can solve correctly? 1. Peter has found two gold bars in a treasure he just excavated from the ground. But the forest people will not let him take away their treasure. He runs and come across the only rope bridge that connects the other side of the river to the forest. Peter is aware of the fact that the rope can accommodate the weight of only 90 kg. He weighs 70 kg and the gold bars are each 13 kgs. Still, he manages to cross the rope bridge without shredding any cloth off his body. 2. King Akbar sentenced a man to the death for some crime he had committed. Known for his kindness, the king told the culprit that he had a choice to die through a way he decides. The culprit was clever and said something that saved him from death. What method do you think he must have chosen for his death? 3. This is an unusual paragraph. I'm curious how quickly you can find out what is so unusual about it? It looks so plain you would think nothing was wrong with it! In fact, nothing is wrong with it! It is unusual though. Study it, and think about it, but you still may not find anything odd. But if you work at it a bit, you might find out! Try to do so without any coaching! 6. Four fathers, three grandfathers and four sons go to the theatre. What is the minimum number of tickets they need to buy?